First Trust High Income Long/Short Fund objective is to achieve current income with capital appreciation. It uses its assets to purchase a portfolio of US and Global high yield corporate bonds of varying maturities. This closed end fund has $872 million of total assets. The current yield is 7.74% per year. The current fund price is also trading 6.38% discount to its NAV. The expense ratio is 2.10% (including 0.80% interest expense). 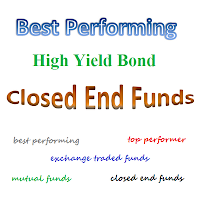 This top performer high yield bond CEF is introduced to public on September 28, 2010. As of 12/2/2012, the fund’s shares price is $17.91. It has an average duration of 4.14 years. There are 200 holdings in its portfolio. As of August 2012, the top 3 holdings are American International Group FRN 5.75 15 Mar 2067, Egg Banking 7.5% 7.50 29 May 2049, and GE Capital Trust 4 4.625% 4.63 15 Sep 2066. The top 5 sectors are services (19.36%), basic industry (13.52%), energy (10.57%), insurance (8.06%), and banking (7.86%). Invesco Van Kampen High Income II fund invests majority of its assets in high yield fixed income securities. The fund managers are Darren Hughes and Scott Roberts. Both of them started managing this fund in June 2010. The fund has a dividend yield of 7.78%. The current shares price is $17.89. As November 2012, the fund total net assets are $187.72 million. It also has 26.55% effective leverage. The fund market price is traded at 4.44% premium from its fund’s NAV. The fund annual expense ratio is 2.38%. This top performer high yield bond fund is sponsored by Invesco Advisers. It also has average maturity of 6.64 years as of September 2012. As of October 2012, the fund’s top 10 holdings are International Lease Finance, Intelsat Jackson Holdings, MGM Resorts International, Levi Strauss & Co New, Zions Bancorp Pfd, Regions Financial Corp New, HCA, International Lease Finance Mtn Be, Tutor Perini, Jones Apparel Group Inc and Ally Financial. The top 5 sectors are consumer cyclical (21.45%), communications (11.46%), energy (8.28%), capital goods (8.14%) and consumer non-cyclical (7.92%). The investment objective of Helios Strategic Income fund is to seek current income and capital appreciation. It focuses its investment in bonds and equities. It is managed by Richard Cryan, Dana E. Erikson and Mark Shipley. This closed end fund current total net asset is $56.732 million. The fund also charges 2.69% annual expense ratio including 2.14% baseline expense and 0.55% interest expense. The fund market price is traded at 7.90% discount from its NAV. The sponsor is Brookfield Investment Management Inc. 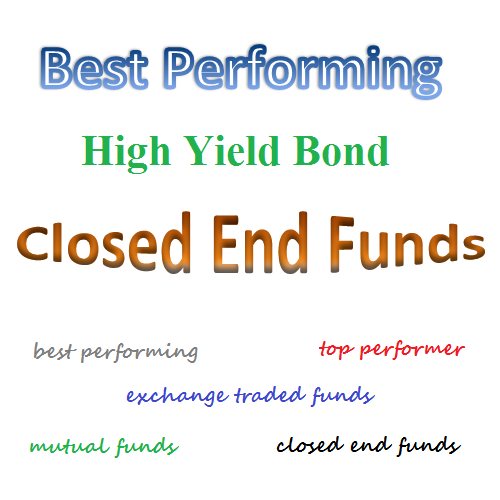 This best performing high yield bond closed end fund is ranked with 2 stars rating by Morningstar. The fund’s market price has returned 22.95% over the past year and 15.45% over the past 3 year. Last year (2011), the fund has returned 11.50% and it has current YTD performance of 23.50% (until November 30th, 2012). As of June 2012, the top 3 sectors are high yield corporate debt (59.58%), investment grade corporate debt (15.87%) and mortgage-backed sectors bond (14.95%). The top 10 holdings as of September 2012 are Anheuser Busch Inbev Worldwide, Dow Chemicals, Greenwich Cap Cmbs, CD 2007, Alcoa, US West Communications, Wachovia Cmbs, Bear Stearns Cmbs, Morgan Stanley Cap, Lb-Ubs Cmbs and Citizens Comms. The BlackRock Strategic Bond fund charges 1.45% annual expense ratio. It utilizes its assets to purchase a diversified portfolio of fixed income securities including corporate bonds. The fund has total net assets of $128 million, inclusive of 22.78% effective leverage. It also has dividend of 6.73%. This yield is distributed on monthly basis. As of August 2013, the average portfolio turnover is 47.00%. Ranked with 3 stars rating, the fund’s market price is traded at 2.87% premium from its fund’s NAV. Since its inception, the fund market price has returned 9.19%. The average UNII per share is $0.1149. In 2009, the fund managed to have a YTD return of 51.31%. As of August 2012, the fund top sectors are corporate bond (77.13%), securitized loans debt (16.09%), net current assets (2.64%), preferred shares (1.38%), and general equity (1.29%). The fund consists of 448 holdings as per August 2012. The top 10 are Clear Channel WW Holdings, Intelsat Jackson Holdings SA, Springleaf Financial Funding Co, Delphi Automotive PLC, Progress Energy, TCI Comms, Level 3 Fing, Ally Financial, Dynegy Power LLC, Gas Co Term Loan, Amer International Group and Novelis. This Credit Suisse High Yield Bond fund invests mainly in non-investment grade US fixed income securities. The current expense ratio is 2.20% per year. It also has an effective leverage of 31.84%. The portfolio management team consists of Michael Gray and Martha B. Metcalf. This high yield bond fund has returned 21.86% over the past year and 9.76% over the past decade. It also has average duration of 2.77 years and an average maturity of 5.52 years. The shares price is $3.17. As of October 2012, the top 10 holdings are State Street Euro Dlr Time Dep Cdn Incor, Mcmoran Explor, Nexstar Broadcasting, Spansion, UCI International, Pioneer Drilling, Syniverse Holdings, Epicor Software, Quadra Fnx Mng, Affinia Group and Block Comms. The top sectors is Debt – Corporate High Yield (86.27%).